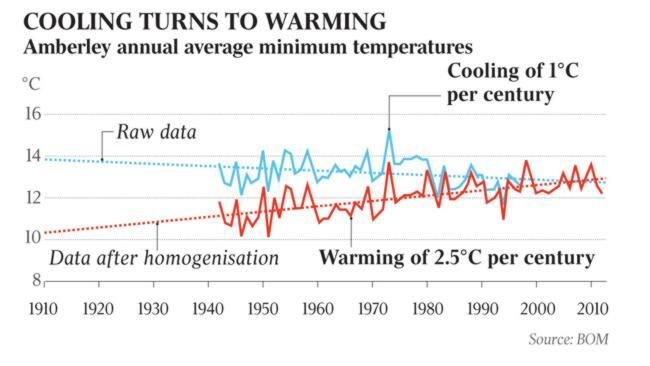 One of the most extreme examples is a thermometer station in Amberley, Queensland where a cooling trend in minima of 1C per century has been homogenized and become a warming trend of 2.5C per century. This is a station at an airforce base that has no recorded move since 1941, nor had a change in instrumentation. It is a well-maintained site near a perimeter fence, yet the homogenisation process produces a remarkable transformation of the original records, and rather begs the question of how accurately we know Australian trends at all when the thermometers are seemingly so bad at recording the real temperature of an area. Ken Stewart was the first to notice this anomaly and many others when he compared the raw data to the new, adjusted ACORN data set. Jennifer Marohasy picked it up, and investigated it and 30 or so other stations. In Rutherglen in Victoria, a cooling trend of -0.35C became a warming trend of +1.73C. She raised her concerns (repeatedly) with Minister Greg Hunt. Now the Australian Bureau of Meteorology has been forced to try to explain the large adjustments. Australians may finally gain a better understanding of what “record” temperatures mean, and the certainty ascribed to national trends. There is both a feature and a news piece today in The Weekend Australian. The odd case of Amberley minima. If you live nearby the local thermometer would say that mornings now are slightly cooler for you than they were in 1941. The BOM says otherwise. THE Bureau of Meteorology has been accused of manipulating historic temperature records to fit a predetermined view of global warming. Researcher Jennifer Marohasy claims the adjusted records resemble “propaganda” rather than science. “‘BOM has rejected Dr Marohasy’s claims and said the agency had used world’s best practice and a peer reviewed process to modify the physical temperature records that had been recorded at weather stations across the country. ‘It said data from a selection of weather stations underwent a process known as “homogenisation” to correct for anomalies. It was “very unlikely” that data homogenisation impacted on the empirical outlooks. Except we know from Ken’s work (and many others in the informal BOM audit team) that the homogenization and adjustments do affect the trends – pushing minima trends of over 100 stations up by nearly 50% compared to the raw data. ‘”In a statement to The Weekend Australian BOM said the bulk of the scientific literature did not support the view that data homogenisation resulted in “diminished physical veracity in any particular climate data set’’. ‘Historical data was homogenised to account for a wide range of non-climate related influences such as the type of instrument used, choice of calibration or enclosure and where it was located. “All of these elements are subject to change over a period of 100 years, and such non-climate ­related changes need to be ­accounted for in the data for ­reliable analysis and monitoring of trends,’’ BOM said. ‘Account is also taken of temperature recordings from nearby stations. It took “a great deal of care with the climate record, and understands the importance of scientific integrity”. ‘BOM said the adjustment to the minimums at Amberley was identified through “neighbour comparisons”. It said the level of confidence was very high because of the large number of stations in the region. There were examples where homogenisation had resulted in a weaker warming trend. Amberley is near Brisbane which also shows a cooling raw trend, though other neighbours like Cape Moreton Lighthouse, Bundaberg, Gayndah, Miles, and Yamba Pilot Station have an average warming trend. (See Ken’s Kingdom) NASA’s Goddard Institute also adjusts the minima at Amberley up by homogenization with other stations. But the radius of those stations is nearly 1,000 km. These other sites may themselves have had real warming, or an urban heat island effect, or other equipment changes or relocations. It’s a messy business. The BOM rarely portrays how complicated and messy it is, nor how much the final trends are affected by their complicated adjustment processes. ‘In the case of Rutherglen, she says, the changes do not even appear consistent with a principle in the bureau’s own technical manual, which is that changes should be consistent with trends at neighbouring weather stations. At Burke, in western NSW, BoM deleted the first 40 years of data because temperatures before 1908 were apparently not recorded in a Stevenson screen, the agreed modern method. Marohasy says this could have been easily accounted for with an accepted algorithm, which would not have changed the fact that it was obviously much hotter in the early 20th century than for any period since. Instead, the early record is deleted, and the post-1910 data homogenised. ‘Marohasy’s research has put her in dispute with BoM over a paper she published with John Abbot at Central Queensland University in the journal Atmospheric Research concerning the best data to use for rainfall forecasting. (She is a biologist and a sceptic of the thesis that human activity is bringing about global warming.) BoM challenged the findings of the Marohasy-Abbot paper, but the international journal rejected the BoM rebuttal, which had been prepared by some of the bureau’s top scientists. This has led to an escalating dispute over the way in which ­Australia’s historical temperature records are “improved” through homogenisation, which is proving more difficult to resolve. If Marohasy is right, contrary to widely published claims, last year cannot be called the hottest year on ­record. But in furious correspondence with BoM, Marohasy argues the computer “homogenisation” of the records is being undertaken in a way that is at odds with its original intent. “In (George Orwell’s) Nineteen Eighty-Four Winston Smith knows that, ‘He who controls the present controls the past’. Certainly the bureau appears intent on improving the historical temperature record by changing it,” Marohasy says.